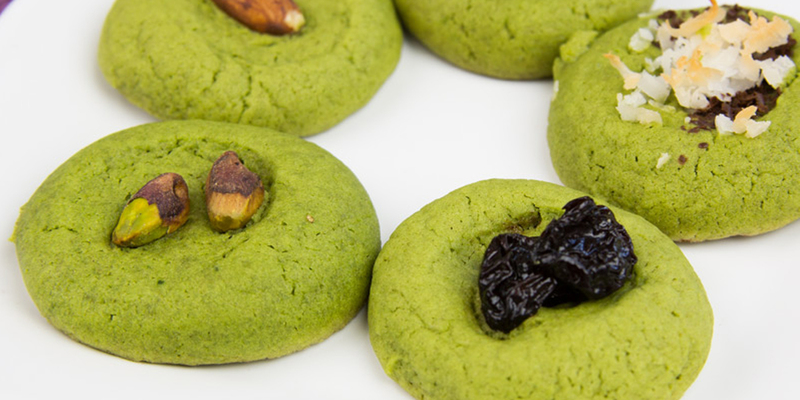 Cut unhealthy cookies from your diet and try this healthy matcha alternative. Preheat oven to 350°. Mix all dry ingredients together. Mix all wet ingredients together. Combine dry and wet ingredients, and mix thoroughly. Lightly oil two large baking sheets. Scoop out about 1 1/2 to 2 teaspoons cookie dough for each cookie, roll into 1-inch balls, and place in rows on the cookie sheet about 2-inches apart. You should have approximately 7 rows of cookies with 10 or so cookies in each row. Press the center of each ball of cookie dough down with your thump to form an indentation. Fill approximately 10 cookies in each row with one of the following fillings: 2 dried cherries, 1 almond, 2 pistachios pressing them down slightly. Fill one more row of cookies with 1/4 teaspoon grated chocolate and 1/4 teaspoon coconut in each indentation, and one row with 1/2 teaspoon shredded coconut. Do not fill the last remaining row cookies with grape butter until after baking. You should now have 7 rows of cookies with approximately 10 cookies each, with one row unfilled. Bake 18 to 20 minutes. Remove immediately and allow to cool. Fill the remaining unfilled cookies with about 1/4 to 1/2 teaspoon grape butter. Arrange all cookies on a serving platter. To store, place in a cookie tin or box with layers of baking or wax paper between each type of cookie. Cover with a lid to prevent the green tea from oxidizing and loosing its bright green color.